Autor: Emina Bužinkić and Marijana Hameršak, eds. This monograph represents an important analytical document. It provides an account of the impact the global phenomenon referred to as the refugee crisis had on the local micro-level in a particular moment in time: in the newest EU Member State, Croatia, during the period when the Western Balkan route was officially managed by the transit states rather than human smugglers. The main topic of this book is one of the most relevant themes in contemporary migration and refugee studies not only in national (Croatian) academia, but in the international scholarly arena as well. 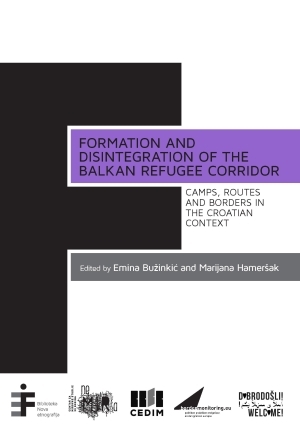 This book represents an extraordinary contribution to the understanding of not only the Croatian part of the migration corridor in 2015 and 2016, but the whole Balkan route as such, as well as the understanding of European migration policies and their ramifications. In addition, all of the chapters in the book are underpinned by a strong research foundation, and are centered around key theoretical frameworks. They also present a practical potential due to problematizing the ways that shape, transform, and regulate migration practice and related concepts. The refugee crisis has been one of the key political issues in Croatia during the last two years. This book represents one of the pioneer pieces that offers both academic texts and texts written in a broader, public friendly language. I strongly believe that the book Formation and Disintegration of the Balkan Refugee Corridor will become an indispensable resource to all those interested in the refugee situation between September 2015 and April 2016. In addition, this book is already serving researchers who are slowly but steadily establishing and expanding the academic field of forced migration in Croatia. Institut za etnologiju i folkloristiku jedinstveno je središte folklorističkih, etnoloških, etnomuzikoloških i srodnih znanstvenih istraživanja u Republici Hrvatskoj s težištem na interdisciplinarnim i transdisciplinarnim kritičkim istraživanjima kulture. Pročitao/la sam pravila zaštite privatnosti i želim se prijaviti na newsletter.